The jig in the pictures below was designed by Dave England, and he was able to get a few of them made. I was lucky to get my hands on one. The jig consists of a front and rear axle carrier, milled out to take 1/8 inch axle. You can use 3/32 inch axles if you slip a 1/8 inch OD tube over the axle where it fits into the axle carriers. 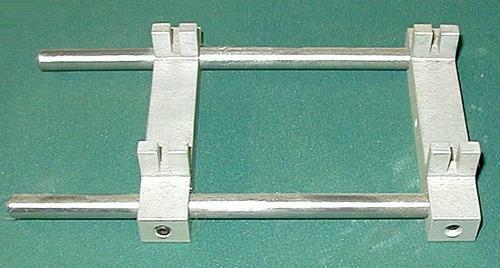 The width between the right and left axle carrier is 2 inches. The Jig can be adjusted to fit any chassis wheel base. For all of my chassis building, I use a propane torch, so I use metal jig wheels. My jig wheels are usually made out of aluminum stock. I have also found that some of the old spur gears or even old inline gears are the right diameter for the wheels and tires I use on my cars. 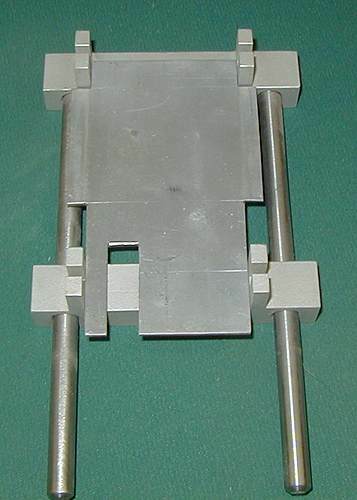 Dave's design is based on the Russkit jig (above) that was very popular in the 60s. To make the jig a little more builder-friendly, I have made up a jig plate to fit in between the two axle carriers. 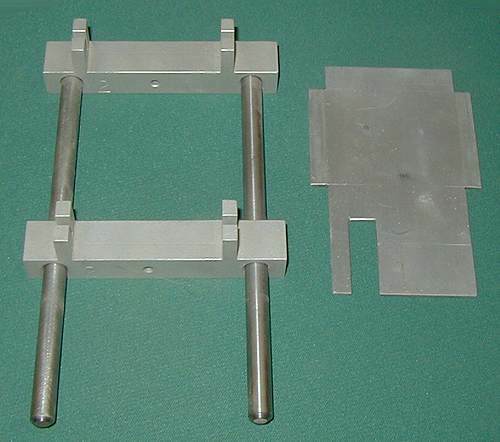 The jig plate is made of 1/16 inch thick aluminum sheet. You should be able to get the sheet alumimun at any good hobby store. The idea behind the jig plate is to give the chassis parts a nice level surface to sit on when soldering. The jig plate also sets my ground clearance for me. The notch in the jig plate is cut out so I can fit my sidewinder or anglewinder gears on the axle. This lets the gear clear the plate and lets the jig wheels sit flat on the outside surface of the sxle carriers. A good jig is a must-have for me to do any type of building. The design of the Dave England Jig is simple for a good machinist to make up. It should serve you well for many years.